My kiddos will happily support the pumpkin patch, corn mazes, orange lights, falling leaves, free candy, and spooky decorations, but they despise October 31st. Wear costumes? No, thanks. Trick-or-treating is out of the question. These are aversions that I had to pause to wrap my head around—because what kid doesn’t love dressing like a superhero and collecting free candy? I had visions of my adorable children dressing up, turning our Radio Flyer into the Batmobile, and joining a neighborhood trick-or-treating posse. Every October, I start concocting costumes for the whole family. And every Halloween, without fail, my kids have meltdowns. If Gwyneth can coin the phrase, “conscious uncoupling,” then my family is hereby consciously uncoupling with Halloween. It’s conscious un-Halloweening. Create a visual story of what Halloween may be like for your child. Try on costumes before Halloween; and if your child does not like his costume, don’t make him wear it. Speaking of costumes, consider a Halloween costume that fits over your child’s regular clothes, such as butterfly wings or capes. Practice going to a neighbor’s door, ringing the bell or knocking on the door and receiving candy before the big day. Know your child’s limits and do only what he or she can handle. Take your child to an activity in the community, such as a school festival or a neighborhood party where the child is already comfortable and knows people. Also partner with family and friends that your child likes. 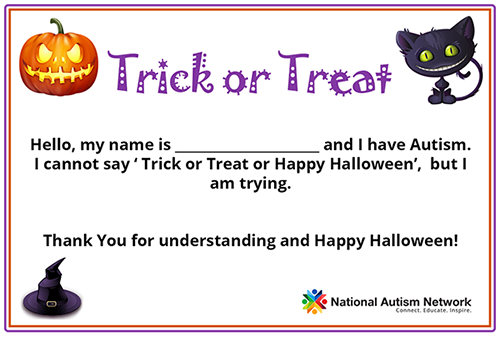 If you are giving out candy at your home, give your child the option to give a piece of candy. During the day, practice greeting people and giving out candy. The Easter Seals also provide ideas for sensory-friendly Halloween alternatives here. He was in tears after ringing the second doorbell and had to be carried home. Our neighbors were all nice and patient, but Thing 1 wanted to be home, on the couch, and naked. Wearing layers, let alone a costume, is not his idea of fun. 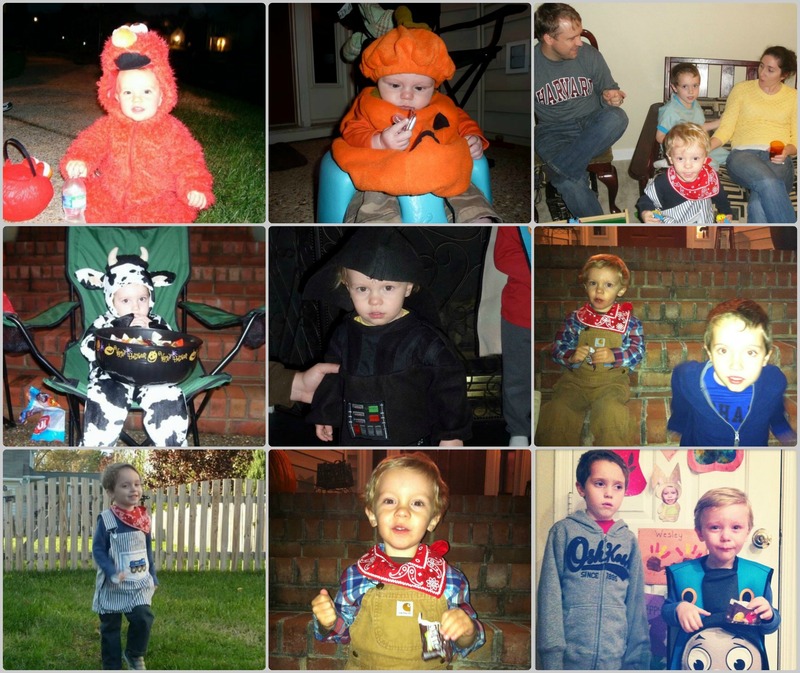 Our kids’ costumes over the years have been basic one-pieces or Melissa & Doug dress-up items, and I still feel like I am torturing the boys. This year, we are liberating ourselves and not stressing out our kids. Instead, the boys and I decorated our front porch with a straw bale, mums, pumpkins, and a light-up ghost. Thing 2 picked out the ghost and declared it, “REALLY SPOOKY!” Thing 1 felt strongly about buying yellow mums. Thing 3 chose decorative metal stakes for the yard, including a dancing spider. We had fun, the porch looks amazing, and no costumes, children, or parents were injured in the process. At only 18-months old, Thing 3 doesn’t care or feel left out (yet), so this Saturday we are taking the big boys to a football game and not worrying about ghosts, goblins, and Yoda’s that come knocking. In the grand scheme of things, costumes and trick-or-treating are not life skills my kids need to survive or thrive. I complain when other people try to force my square pegs into round holes, so why should I treat them that way every Halloween? Nope, not anymore. Only took me a few years to get there. 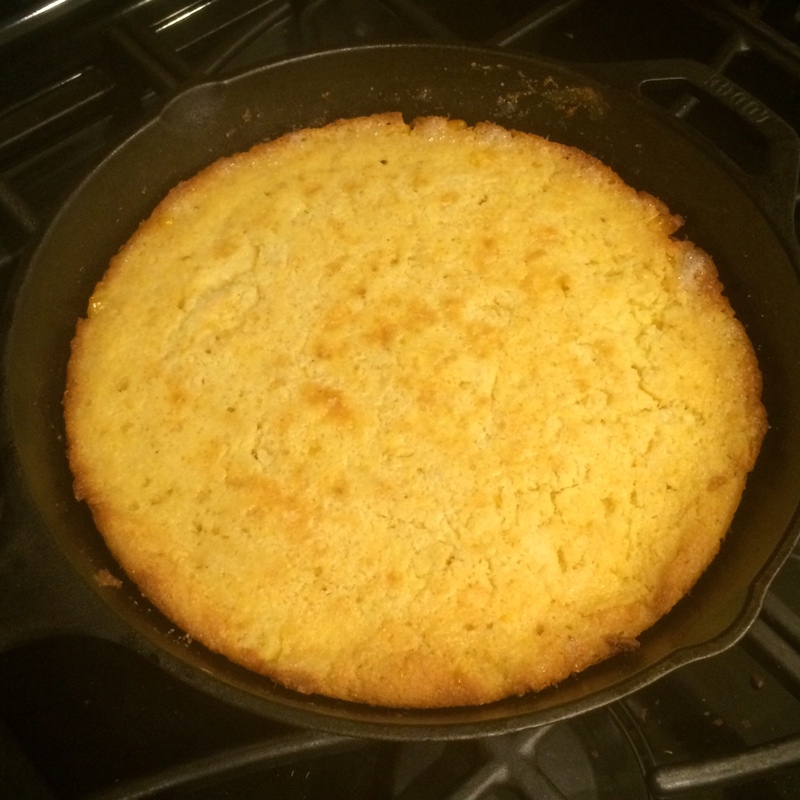 The October air is chilly, and the crisp weather tonight is perfect for chicken soup, cornbread, and pumpkin ale. Once you indulge in this Jiffy on steroids, there will be no going back. Trust me. 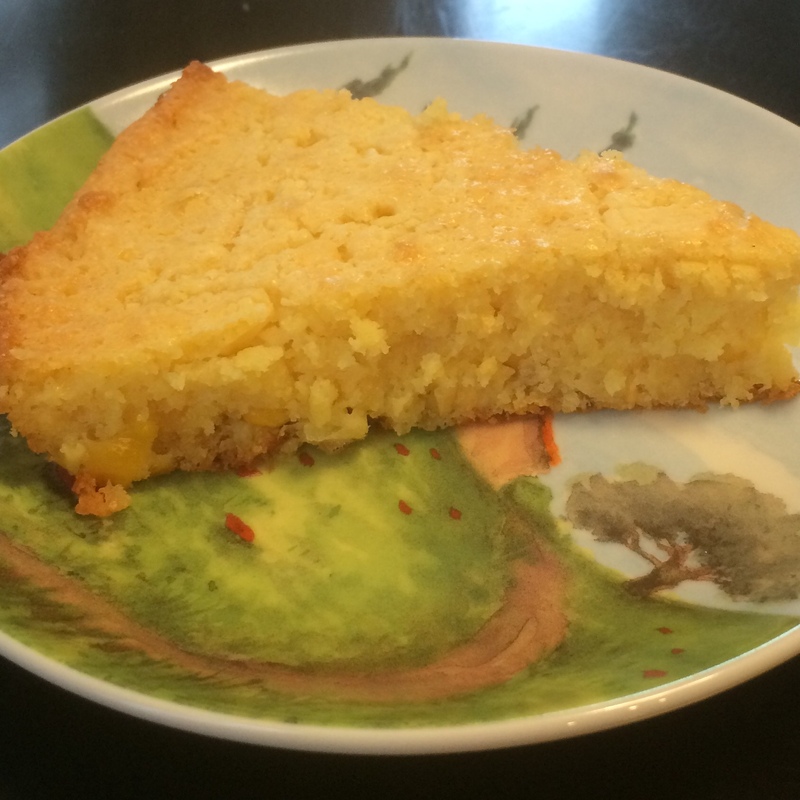 This cornbread is moist and decadent and amazing because it all starts with a stick of butter. I scored the recipe from a card shark named Tanya who dropped off the face of the earth, so I guess she won’t mind me sharing it here. If you copy this recipe, I want you to use REAL butter and shut up about the calories or your diet. Don’t half the amount or sub yogurt or some nonsense like that. Just. Shut. Up. This is what your preheating oven should look like. Preheat your oven to 375 degrees. 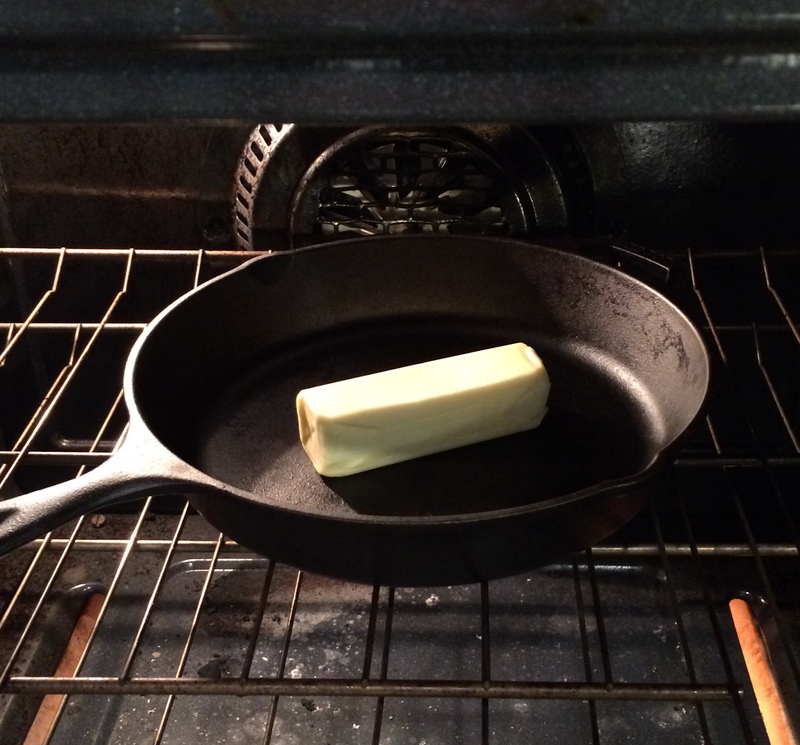 I put the stick of butter in my cast iron skillet to melt while the oven preheats. (Cast iron is preferred, but any baking dish will do). 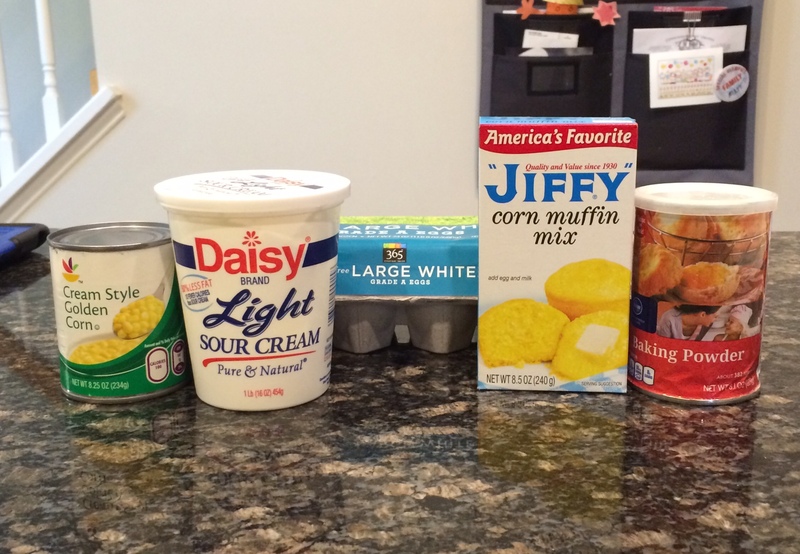 Combine the Jiffy, eggs, sour cream, baking powder, and cream corn. Add that mixture to your hot skillet with the melted butter. Listen to the sizzle as the batter hits the pan and think, “Ooooohhh, yes.” Bake at 375 for 5 minutes, then lower the heat to 350 and bake for an additional 25 minutes. I’ve added cheddar cheese, jalapeños, cayenne, or paprika, but this original recipe is my favorite. It’s the perfect sidecar to a bowl of chili or soup. It is so good! He is so stinking cute. Thing 1’s affection for Roald Dahl’s Mr. Fox knows no limits, and I’m not even talking about the movie. Fantastic Mr. Fox was the first big-boy chapter book we read together, and it holds a special place in our hearts. 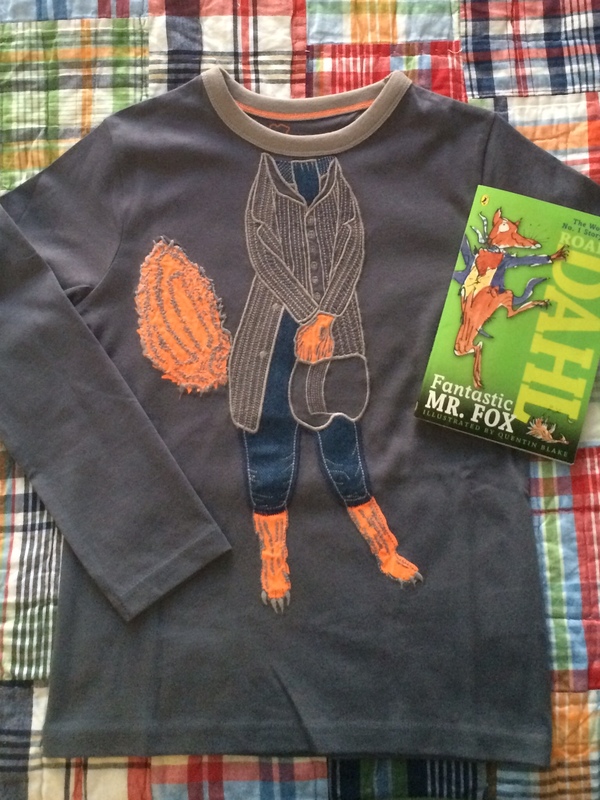 When I saw Mini Boden was also loving on Mr. Fox this fall, I knew my kiddo needed this shirt. I love all things Boden. Their top quality and cheeky prints make me happy. Their shirts and pants are also autism-friendly without itchy tags or seams. When the clothing lasts through three rough-and-tumble boys, it’s even better. My kids excel at phonics and can tell you all the letters and their sounds, but literacy–recognizing sight words and putting letter sounds together–is a challenge. I blame that on autism because it’s related to clear processing and comprehension delays for both Things 1 and 2. But our boys enjoy being read to, so we keep reading. Thing 2 has memorized a lot of books and can “read” them to us. 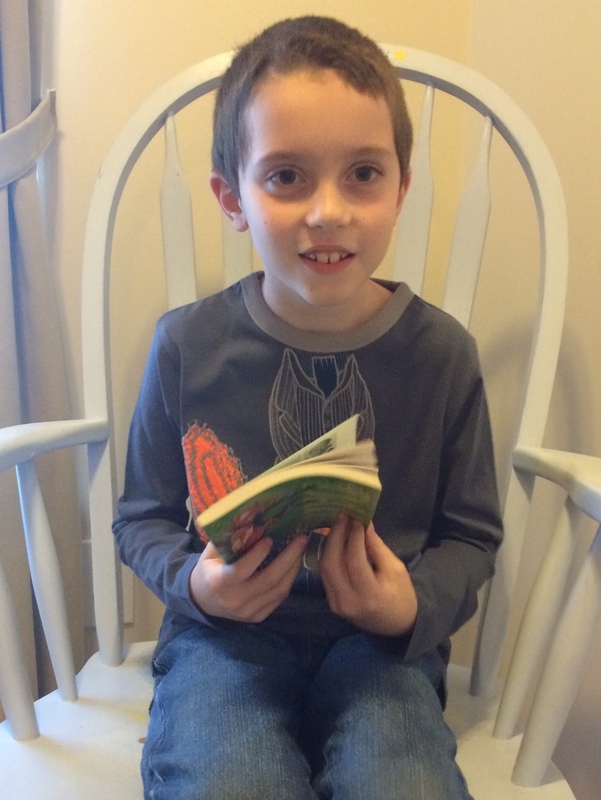 His favorites are Roly Poly Pangolin and Llama Llama books by Anna Dewdney, anything by Bill Martin, Jr., the Pete the Cat series by Eric Litwin, and Dr. Seuss’ The Lorax. Thing 2 tells me frequently that he speaks for trees. 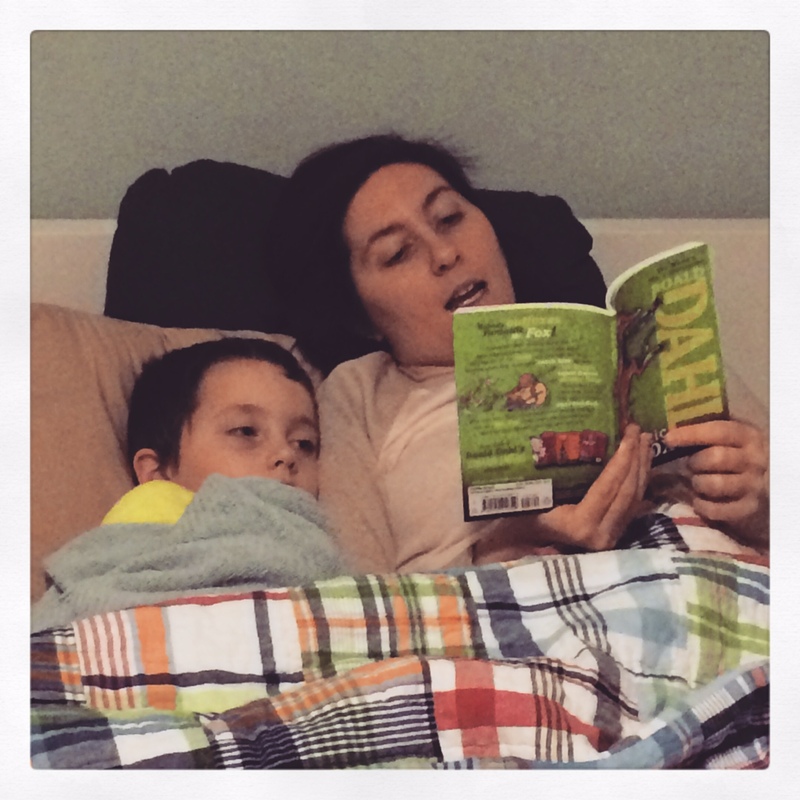 Some days he tells me he speaks for trees repeatedly at 3:00 a.m. Thing 1 is a fan of the Step into Reading leveled readers, and he loves We’re Going on a Bear Hunt by Michael Rosen. When Thing 1 started first grade, though, I tried to move him beyond the rhyme-time books, and in walked Roald Dahl and Fantastic Mr. Fox. We read three of the short chapters every night, and he was captivated. He loved the story, the illustrations, and the cleverness. He smiled as Mr. Fox outsmarted Boggis, Bunce, and Bean again and again. 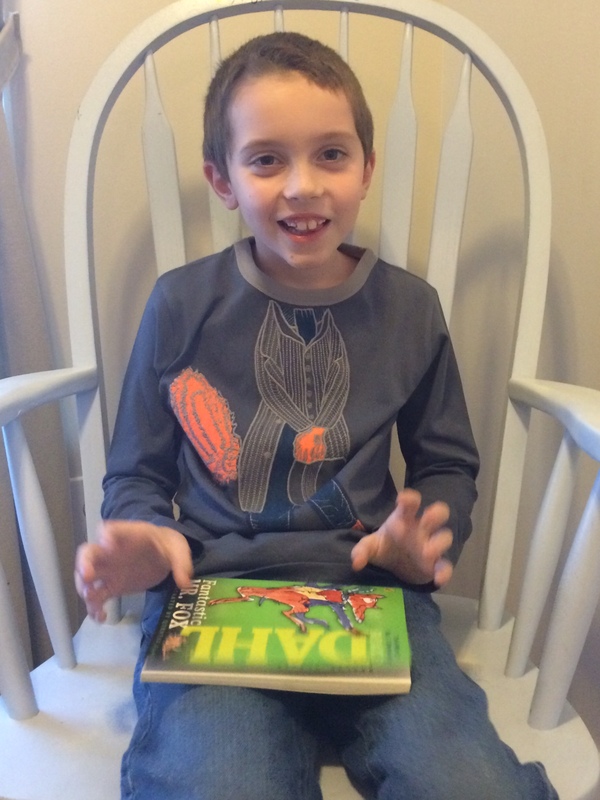 When we finished the book, Thing 1 quietly sat in his bed and stared at the cover for a while. Dahl was a hit, so I hit Barnes and Noble for more books the next week. We gave The Twits a try, but Mr. Dahl’s opinion on beards halted us: “When a man grows hair all over his face it is impossible to tell what he really looks like. Perhaps that’s why he does it. He’d rather you didn’t know.” My baby-daddy is one of those bearded men. As clean as he is, let’s just say it got awkward. Thing 1 kept taking the book away and handing me Mr. Fox instead. We then started James and the Giant Peach but did not make it past the first 20 pages. Reading about those nasty aunts tormenting James, Thing 1 grabbed the book and shouted, “NO!” I promised it would get better, but he didn’t believe me. He would not tolerate the sadness of James’s tears, threw the book across the room, and pulled Mr. Fox out of his book basket. Thing 1 and I are about to start our third reading of Fantastic Mr. Fox, and Mini Boden is the bees knees for making a Mr. Fox shirt for my clever-as-a-fox son. Like the protagonist, Thing 1 shows us plenty of perseverance, love for family, and ingenuity every day. Maybe that’s why he finds this book so endearing. Guess what he’s wearing for school picture day this year.